This is the most heartfelt and emotional story about this young girl who is so different from the normal horde,it’s really heartbreaking and sad about how other students in Mica shun her for being so different. 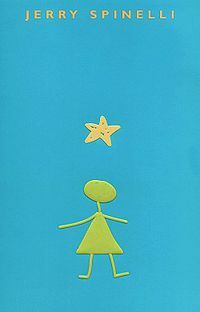 The story revolves around two protagonist ,the Stargirl and Leo.Leo who from the first day of stargirl in school is mesmerized by her and enchanted by every chore of her and is in love with her. Stargirl never pretends and does things what she truly feels and her perception to things is so out of this world and this was the reason for her not being accepted by other students in school,they believed she did all this to become popular.But stargirl was different as her name,what she saw went straight to her heart.She found happiness and satisfaction by noticing and feeling for those things which others eyes seldom saw. Leo who is boggled by every single and small task done by star girl and finally finds himself caught amidst his unconventional love to stargirl and his desire to regain notice of other students which he had lost as he had become part of shunning of stargirl,and he had become popular as Mr Stargirl. Its a story about what huddles one has to go through on being away and different from the normal horde. And about the inspiring love which keeps Leo embarked on the boat of life,where he no more feels lonely. And the impact of selfless,kind,ingeniousness soul like stargirl who had become a victim of grisly shunning had left traces of her infinite kindness,selfless deeds and her ukulele in Mica’s heart.